Cambodia has discovered it may have a claim to another set of objects in New York. But these statues are on display at the Met, not up for auction. The contested statues may have been taken from the same temple where a mythic warrior figure (discussed earlier here) was likely looted in the early 1970s. It seems the Cambodians have uncovered other objects which they may have tenable claims for in the wake of the research into the statue from the Koh Ker complex which was removed from auction at Sotheby’s last month. Federal prosecutors have initiated a forfeiture proceeding against that statue, based on the fact that despite the armed conflict at the time, Cambodia’s earlier pre-existing legal principles had established the statue was owned in some way—and thus any removal would have been an illicit removal. The museum acknowledged that beyond the names of the donors it has no records on the statues’ origins, despite a longstanding policy to investigate the history of donated antiquities. “No one is concealing anything,” said Harold Holzer, the Met’s senior vice president for external affairs. “I’d like nothing better that to find more documentation.” Mr. Holzer cautioned against using current standards for museum collecting to evaluate the propriety of acquisitions dating back more than two decades. “There were no real prevailing restrictions against accepting these works of art,” he said of the period, “especially if, by doing so, they might be protected from disappearance completely from public view and from study.” The Met’s policy in 1992 allowed it to accept works without a detailed provenance. Such acceptance, though, was supposed to come after an effort had been made to root out the history of a piece in case it was illicit. 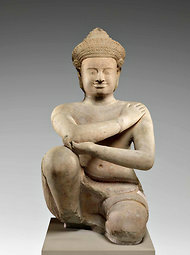 Tom Mashberg & Ralph Blumenthal, Cambodia to Ask Met to Return 10th-Century Statues, The New York Times, June 1, 2012. Next Next post: Will US Attorneys Appeal after latest Ka Nefer Nefer setback?